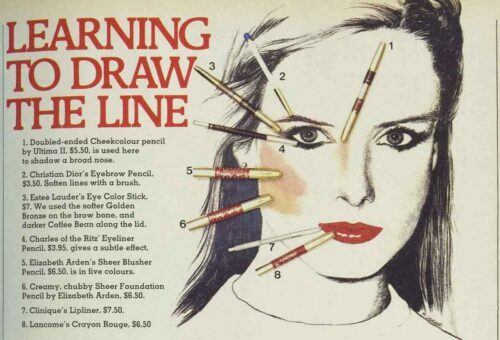 It’s 1978 and beauty makers are giving women more and more makeup pencils, to ‘draw’ their faces. They look smart, neat to carry, and they make putting on a face much more fun. Some pencils have been around for a long time of course. The first was the simple eyebrow pencil. While smart women used it to outline their eyes, all the time they knew it was too hard, dragging on the skin. So the next release in the early 1950s was a much softer brow and eye liner pencil, which was such a hit that for a time, lipstick took second place to the doe-eyed make-up look of the 1950s. Close behind came lip pencils. But now Elizabeth Arden has surprised everyone and put foundation and blusher into pencils too. Pencils are great for women who love to touch up their makeup in the day but don’t want to carry round bottles of base and plastic eyebrow packs. Have the following eight make-up pencils in your bag, and you’re good to go. and darker Coffee bean along the lid. 4.Charles of the Ritz‘ Eyeliner pencil. This is for a great subtle effect on the lids. 5.Elizabeth Arden‘s Sheer Blusher Pencil.